A charming upscale Bed & Breakfast Chateau set back from a lake in Haute Provence that offers time travel back a good 50 years to the France of yesteryear. Filled with antiques, texture, and an authentic experience of what it was like to spend time in the family country seat but with modern bathrooms, comfortable beds and a true warm welcome. 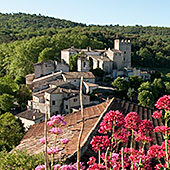 We don't normally cover bed and breakfast's, but this Chateau d'Esparron is special. It is the family home of the Marquis de Castellane and his charming and lovely wife Charlotte-Anne and their three children (the youngest is well off in school) who have restored this 13th & 18th century chateau into this lovely and welcoming authentically French experience. 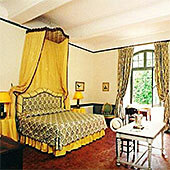 The chateau is filled with antiques and elderly furnishings just as a family country home should be. But the bathrooms are recent and modern and the heating the same. The beds are traditional but the mattresses and springs are modern. The tile is authentic Provence and the stone circular stair case carries the echoes of centuries of exercise. The breakfast chamber has a 15 foot wide fireplace and offers a generous buffet breakfast of delicious breads and croissants, home-made jams and local cheeses from the market, boiled eggs and fresh fruit is served downstairs in the vaulted, stone-flagged old kitchen where on cool mornings a log fire is lit in the huge fireplace and a cuckoo clock to wake you up if the delicious coffee and English tea does not do the trick. There are two floors of 3 spacious rooms each many with anti-chambers that often contain an additional bed or two. They are situated high in the 18th century wing overlooking the countryside and two hundred year old plane trees. With high ceilings, marble fireplaces and floors tiled in the typical warm red Provençal tiles or "tomatoes" dating back to before we were all born. In 2012, they created a "new" one bedroom apartment with a view out over the old village, the new village and the lake. The living room has two single day beds for additional family members, a kitchenette for self catering and what is really special, an indoor/outdoor floor of the original tower for lounging, reading, having tea or snoozing in the hammock. The window openings let in the breeze and the sound of the birds and the thick stone walls keep it cool in the summer. And a refreshing touch - none of the rooms have televisions or mini-bars, nor is there an elevator! (but every room is wi-fi equipped. So you can have a real vacation from the noisy high tech world we live in, or if you just have to have that fix into the communication link, the wifi makes that possible. So if you want to really feel that you are in the heart of France, this is the place for you. From here you can explore the Haute Provence. Esparron is set right at the edge of a vast, high plateau, Le Plateau de Valensole, famous for is fields of lavender and hard wheat. Up stream from the Lac d'Esparron, is the Lac de St. Croix, home to water sports, the famous grand canyon of France - Les Gorges de Verdon - and many charming small villages clinging to the mountain sides and the edge of the lake. There is no lack of things to keep you busy..
For example, if the local village markets and fairs are not enough, the obvious place to start is with is the Lac d’Esparron, a stunning lake of clear, aqua-marine water only a stone’s throw away and not only an extremely pleasant place to swim and have picnics, but full of possible water sports, from sailing, windsurfing and pedalloeing for the energetic (including pedalloes with slides, hugely popular with children) to the more sedate self-drive electric boats (motor boats are forbidden) or the guided tour of the lake in the bateau mouche tourist boat, the "Perle du Verdon". The beautiful, cave-lined Basses Gorges du Verdon which meander from the lake up to the village of Quinson are not as dramatic as the main Verdon canyon, but extremely pretty nonetheless, and a tranquil place to spend a leisurely afternoon in a canoe or electric boat. There are several enjoyable marked walking trails in the area, the most popular being the "Sentier Decouvert" nature trail with an orientation table and superb views. Horse riding and bicycles are a good way to explore the area. Parapente, hot air balloons and glider enthusiasts are catered by Aero-Provence. The Verdon is also well-known as a magnet for rock-climbers. Some of the best places are in the Canyon at La Palud sur Verdon, in nearby Quinson, a fifteen minute drive from here and ideal for beginners as well as more advanced climbers, or even in Esparron de Verdon itself. Quinson is also home to the largest pre-history museum in Europe. If climbing is not adventurous enough you can also try bungee-jumping with Latitude Challenge from the Pont de l’Artuby. The Pierrevert golf course is 45 minutes away over by Manosque for those who find relaxation on the links. Children enjoy the tree-climbing adventure park near Gréoux-les-Bains, and the go-kart track in Manosque. In the spa town of Gréoux-les-Bains 20 minutes away, where ‘taking the water’ dates back to Roman times, an afternoon of spa treatments is a pleasant way to unwind. 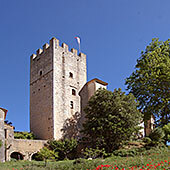 So there is something for everyone here in Esparron and the Chateau d'Esparron is right in the heart of the region. But for much more, including a history of the Castellane family, visit their site.